This is the season when we’re especially aware of The Salvation Army, with their bell ringers and red kettles in front of stores – nine kettles in Sheridan this season. But they are so much more for our community. The Salvation Army is a faith-based social services organization, with Sheridan offices at 150 S. Tschirgi. In 2010, the Sheridan organization provided services to more than 275 families (850 individuals) in need. We all know the thrift store on Coffeen Ave. That store provides about half of the local organization’s needed revenue. But the Salvation Army also provides a food pantry in the main office building (an average of 5,000 visits per month), individual food boxes for special holiday meals, food distribution, warm coats (now being collected and cleaned by the Kiwanis Club and Martinizing Dry Cleaning), Christmas toys for children (for example, distribution of the toys collected at the “Stuff the Bus” campaign this weekend), chapel and pastoral services at their church on the corner of Burkitt & Tschirgi, character building programs for different youth age groups, and financial assistance as funds permit. Historically, the local Salvation Army, which started in Sheridan in 1916, was also a key player in starting many other services that are still thriving in greatly expanded form and leadership in Sheridan ~ the community holiday dinner, the senior center, the community shelter, other food bank operations and, nationally, even Volunteers of America (an American offshoot of the British Salvation Army). The organization’s roots are deep and strong in our community. The current commander of the Sheridan Corps is Capt. 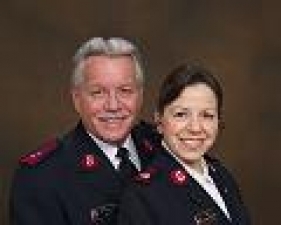 David Leonard, who along with his wife Major Geraldine Leonard (both pictured left) has led the Salvation Army efforts in our community since early 2010. What are today’s biggest challenges for the Sheridan Salvation Army and The Salvation Army nationwide? Funding, as for most nonprofits in this economy. An aging donor base; needing a younger generation to get more involved and more familiar with the organization. And the desperate need for more volunteers. If you can help in any way ~ by your donations or your time ~ give them a call at 672-2444.